I’ve been working on a triptych (three canvases, each 30 x 24 inches) using studies of morning glories from this summer, and I’m finding it very involving. As with many paintings, the triptych idea just popped into my head, the only clear idea being that I knew which three studies would be developed further, and that each painting should be able to stand on its own as well as interconnect with the other two. After all, who knows if I’ll have the opportunity to display them as a triptych? I’ve been focusing on one canvas at a time, and recently I lined them up to see what was going on, or not going on. As is often the case, compositional relationships between the paintings that I hadn’t really thought too much about beforehand became very evident, which supports my belief that a lot of what goes on in painting happens just below the conscious level. Had I planned those relationships, I think the result would have looked contrived. Executed, in both senses of the word. More to follow. It’s been over three years since my last post (maybe falling in love and getting married had something to do with it), but after my annual Monhegan stint, I’m reflecting about how my outdoor painting “kit” has changed. I’m trying out an aluminum Winsor & Newton Bristol easel as a replacement for my beloved half-box Jullian. Pros: It’s light, and I can easily carry it over my shoulder. If I hang my backpack from the top, the wind doesn’t blow it over. Con: I miss the waist-height drawer. However, by exercising a little ingenuity, along with the aid of heavy-dutyVelcro and binder clips, I have a small “shelf” (a single mesh silverware drawer divider) at waist height that’s enough for some solvent, charcoal, and a few brushes and other necessities. And with binder clips I was able to clip my folding brush holder to it so brushes are within reach. By the time I am too decrepit to scramble up and down the trails of Monhegan Island, I will have this completely figured out. When one’s time is limited, efficiency becomes more and more important. Spring is actually here, so it’s time to start thinking about painting outdoors. For me, this means getting out the Jullian half-box and tuning it up: tightening screws, lubricating wing nuts, and applying a light coating of butcher’s wax to protect the surface. If you use a wooden easel, it’s wise not to tighten the wing nuts TOO much. A lengthy stay outdoors on a foggy day can cause the legs to swell (the easel’s, not yours) (but maybe yours too) and then the wing nuts will freeze up. I also like to line the drawer with some freezer paper or cut-up pieces of disposable palette paper, because when the inevitable paint tube leaks, it makes cleanup a lot easier. It’s a good time to sort through the studio and pull out half-used tubes of paint for use outdoors — why carry a full tube when half will do? My philosophy of outdoor painting is: think of all the awful things that have happened or could happen when you’re painting, and prepare for them! Here’s today’s painting, to be continued in the studio. I hate cleaning brushes, and today I found a new way to clean them that was really cheap and quick. I bought a bar of Fels Naphtha soap — the kind my mother used to rub on my father’s shirt collars before laundering them — and tried it on the brushes, which had simply been wiped with a rag. The paint came out easily, and the bristles were clean and soft when dry. It will be interesting to see what kind of long-term effect it has on the brushes, but so far it’s encouraging. This isn’t an outdoor painting gizmo per se, but it is definitely one of the most money-saving devices I’ve used – a tube wringer. Gets those last bits out of that expensive tube of cobalt blue very well. They can be purchased from numerous art supply companies and also at tubewringer.com. Opt for the heavy duty one – works best on those fat tubes of white paint. 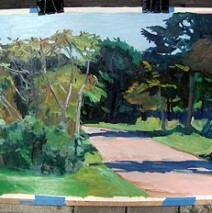 Here’s the outdoor painting part: when your tube is half empty, reserve it for your outdoor painting kit. Full tubes of most paints are rarely needed, unless you paint like Van Gogh, and you’ll carry less weight. For small plastic containers for transporting solvents, try urine specimen containers. I discovered a barrel of these at a surplus place labeled: “Urine Specimen Jars – 6 / $1.00 – Never Been Used”. Check out the fit of the lid if possible; hopefully they are leakproof for all purposes. Since I teach workshops, I am asked for easel recommendations. There is never an easy answer. Do you like to stand or sit while painting? How much can you carry comfortably? Would it be uncomfortable for you to bend frequently while painting? For me, the best solution to date has been the classic Jullian half-box French easel, because: 1.) it’s stable; 2.) I like the drawer at waist height; 3.) the hardware is good (no wing nuts that fly off or latches that pop springs, as in some other brands), and 4.) it allows me to carry a few panels/canvases on the front with ease. I put most of the weight (paint tubes, brushes) into my backpack, and added a better shoulder strap. The recent Jullians have given up the metal drawer in favor of a wooden one — not an improvement in my book. Other options of interest are the aluminum Soltek (expensive), the Anderson with a nifty swivel so you can turn your painting out of the sun, and for lightweight, the Winsor & Newton Bristol. All have their pros and cons. If anyone has discovered The Perfect Easel out there, let me know!